Gardens by the Bay is a park spanning 101 hectares (250 acres) of reclaimed land in central Singapore, adjacent to the Marina Reservoir. The park consists of three waterfront gardens: Bay South Garden, Bay East Garden and Bay Central Garden. 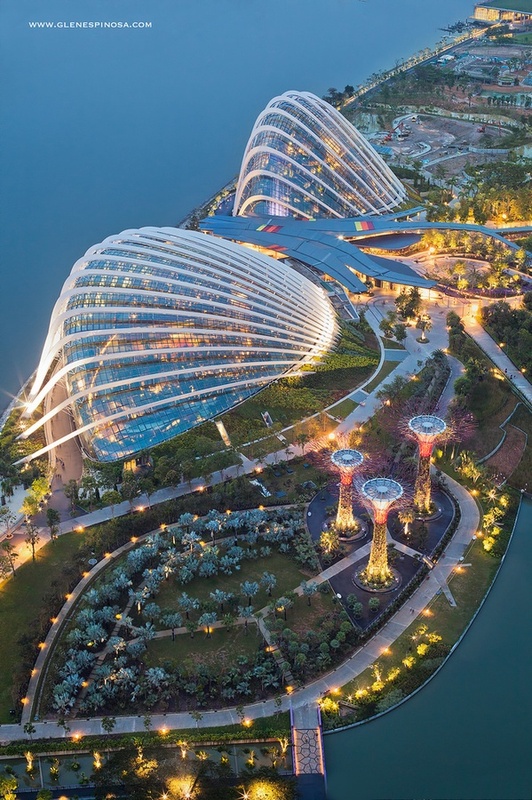 Gardens by the Bay is an integral part of a strategy by the Singapore government to transform Singapore from a "Garden City" to a "City in a Garden". The stated aim is to raise the quality of life by enhancing greenery and flora in the city. First announced to the public by Prime Minister, Mr Lee Hsien Loong during the National Day Rally in August 2005, Gardens by the Bay is intended to become Singapore's premier urban outdoor recreation space, and a national icon. An international competition for the design of the master plan, held in January 2006, attracted more than 70 entries submitted by 170 firms from 24 countries. Two firms – Grant Associates and Gustafson Porter – were eventually awarded the master plan design for the Bay South and Bay East Gardens respectively.